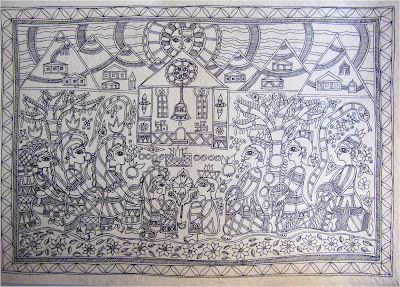 When I make a new Madhubani painting, I usually make it for someone. 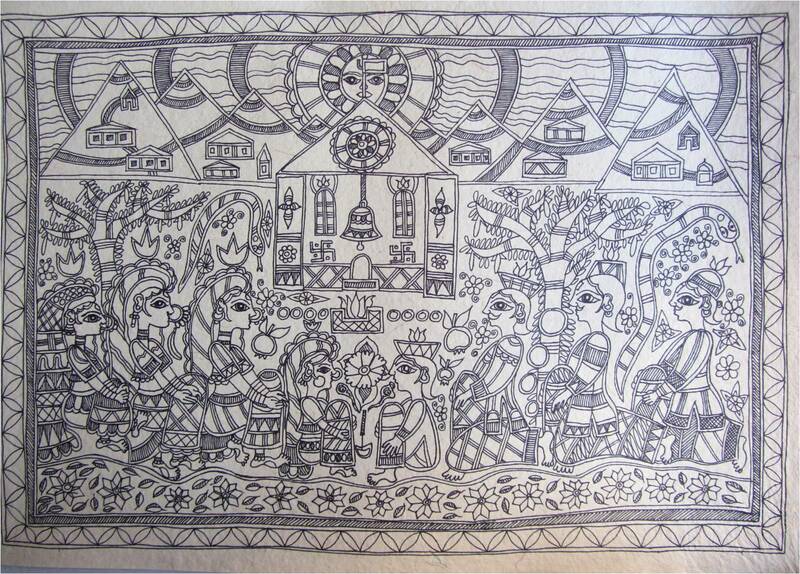 If there is no one to make a Madhubani painting for, I'll find some excuse and make it anyway. So this time I made two Madhubani paintings for our maid Vimla. She has finished constructing an additional floor to her house and I thought some paintings would make nice gifts. 1. "VIMLA'S VILLAGE IN PITHORA GARH"
"Vimla's Village in Pithora Garh"
This painting is not about Bihar, nor about Ramayana. It illustrates Vimla's village in Pithora Garh. The place is mountainous, the hills are green and full of forests. Houses are built on the step like terraces and are multicolored. There are bunches of flowers, snakes and other wild animals. In the middle of this painting we can see a mandir (temple), which is exactly as the one in Vimla's village - tiny, with a huge bell in the middle. Many people are gathered to perform the havan ceremony (pooja - prayer, offering). The occasion is positive. We can see women sitting on the left and men - on the right. They don't necessarily sit opposite but often they do too. Various fruits (a banana, pomegranates, coconuts are scattered over the place - they are prashad (offering). The fire and incense sticks are at the center, symbolizing the life and action. The snakes are there to show that, although everything goes in its normal pace, there is always something more, something invisible, something more meaningful, even paranormal to the routines of people's lives. The men wear a Pahari topi - a traditional cap. 2. 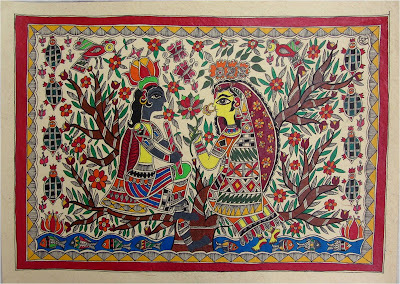 "RADHA AND KRISHNA ON A TREE"
"Radha and Krishna on a Tree"
Many would say that Radha-Krishna on a tree Madhubani painting theme is overused and unoriginal. As a folk art it tends to repeat itself. 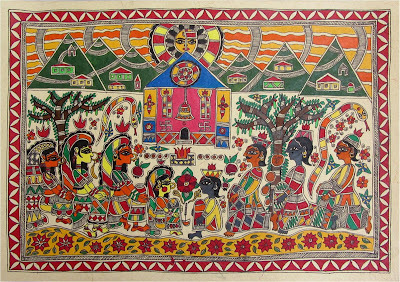 When I was at the folk art fair the last time, I sat by the Madhubani stand on the floor and went through all the paintings they had. I wanted to learn something, to ask the questions, to make a video. The boy who sold these paintings said he was too shy to talk in front of the camera, so I didn't put it on. I was somewhat disappointed seeing that every single painting had ten or more copies of it. If I bought it for 3000 or 5000 rs, it would not have been the only one in India. It would be like swastik, made on every house during Diwali. Even then, I loved the small paintings made by the boy - his hand was inexperienced, the line was fresh and primitive, reminding me of the simplicity power that these villagers unconsciously possessed. It's always worth buying painting from a Bihar villager. In this painting, Radha and Krishna are sitting on a tree, playing. Krishna is holding his flute and Radha is giving him a flower - a symbol of "I like you". The tree is near a river or a pond that is full of fish. Turtles symbolize prosperity and good luck to the one who glares at this painting. The numbers also play an important part in Madhubani symbolism (and in India in general). While in Europe odd numbers symbolize luck, success, long life and prosperity (3, 7) and buckets consisting of even numbers are only given during funerals, in India it's the opposite. There are 8 turtles and 8 fish, eight being a super lucky 2 multiplied by 4. In Feng-Shui (Vastu-Shastra in India), it is said that if there is disharmony between the husband and wife, paintings and sculptures that symbolize the two should be placed around the house and no mirrors to make them four! So this Radha and Krishna symbolizes the two, the two lovers, husband and wife, masculine and feminine energies or whatever you like to call it. It is supposed to bring some oneness and harmony into your family. I think it's great to made up your own symbols. One dream interpreter has said that there can't be a dictionary of symbols to interpret the dreams, because different symbol means different things for each of us. Instead, we should find themselves their meanings. I think this can apply to Madhubani painting too. I wish you good luck making your versions of auspicious paintings for your friends, family and strangers!!! I think your maid Vimla is lucky . You are a great artist. I am going to be a frequent visitor to your wonderful blog. 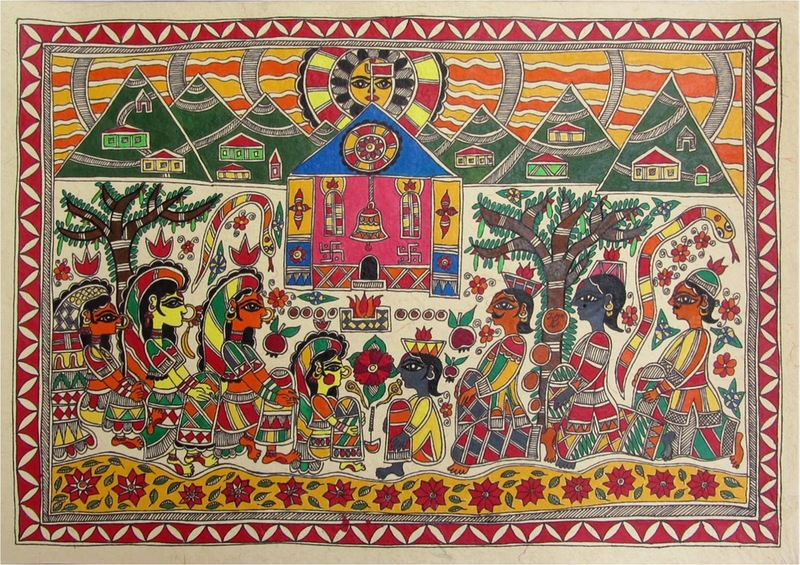 Thanks for sharing this.I live in America ( I do have family in India) and would love to buy Madhubani paintings for my home, Can you tell me where I can buy some? Thank you, Aparna, for the comment! I have some business cards of painters who sell them, I'll have to find them and I will try to note some sites that sell them. Have a great day! Egle. 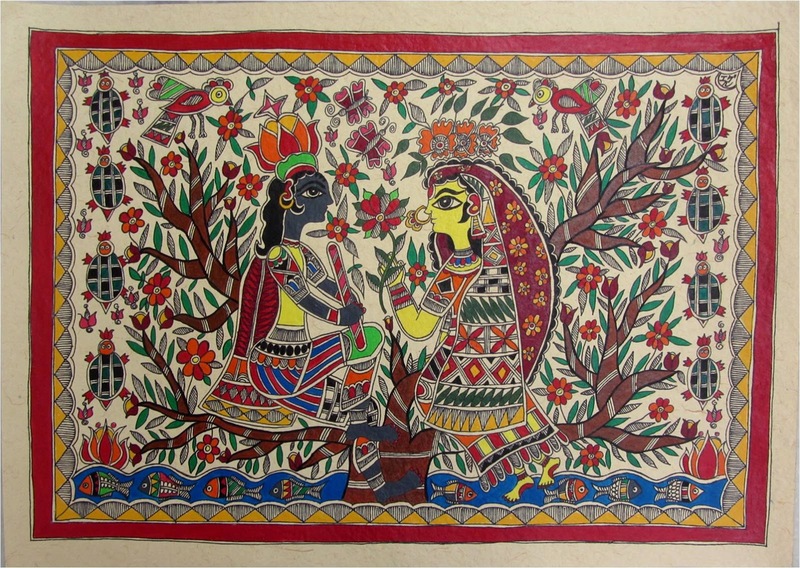 I am in love with kalamkari and madhubani paintings. I have just bought a home and going to shift in couple of days. I wanted one large kalamkari paintings for my hall, searched in the internet and found them very expensive.Thought painting it on my own as i love art. When going through the videos, came across one of yours which landed me in this blog. I feel I'll learn a lott from you and really want to appreciate your love towards typical indian style paintings. 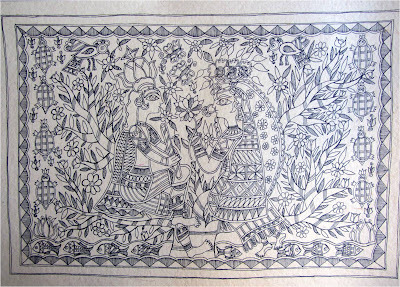 Hello Arpita, I'm very glad to hear about your love of art and Madhubani and Kalamkari paintings. 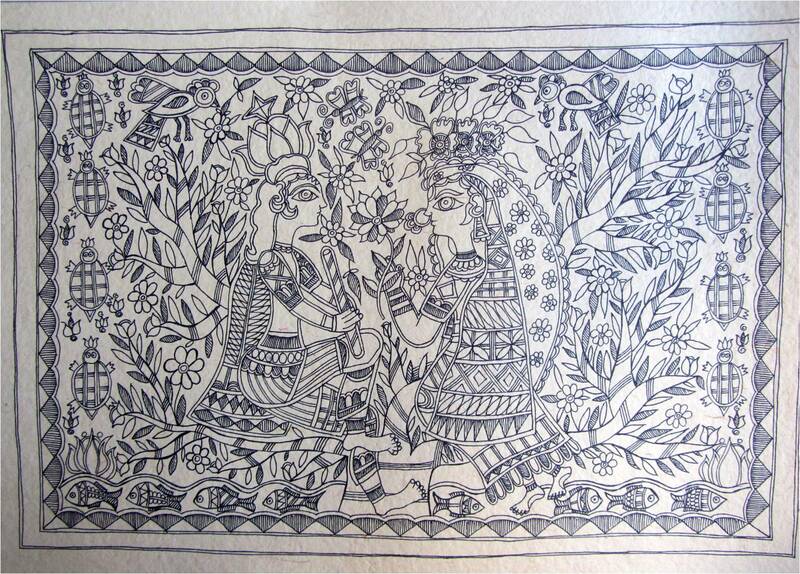 I also love Kalamkari, Warli, Rajasthani and Orissa scroll art. I think that, if you like drawing/painting designs that require loads of detail and line work, it will be really easy to learn and make your own Madhubani/Kalamkari painting. Also, it's always better when you draw it yourself because you learn something new and can also decorate your home. Art also helps to express yourself and bring happiness into your life. Thanks for your comment very much and I really appreciate it! Good luck with your painting and let us know how it goes! Egle. CrazyLassy you mentioned here that you make madhubani for someone, if there is no one you try to find excuse ( you don't need to, you can always paint one for me .. :-p, i would be heads over heels ), we bought a new house, we will be moving there in jan, that too in noida, still i have a month and still im eager to learn from you, cant u plz take my class??? Thank you so much for having this blog and the youtube channel (i came here from your youtube video on madhubani). This is one of the most resourceful blogs on this painting. I am Indian and just recently got hooked on this and Gondh Painting as well. Have you looked into Gondh painting? At first i thought they look very much like Australian Aboriginal art. I am looking for similar resources on that too. I loved the tips you gave on Madhubani art in the video where you show all your art work - i particularly need to learn to use fewer colours. Also it was good to know how important paper quality and colours are for this art. One request - when you make videos please make them of a better quality - less shaking and all.